As I understand it, Secrets is part of a trilogy first published in the UK, and now a US publisher is releasing it. However, they are publishing the third book first, then releasing the others. Odd way to do things, but I've read the books can be read out of order. In this third book of the trilogy, actress Clara Vine has successfully hidden her Jewish roots in order to work in Germany, but throughout the story she worries if she's able to conceal her involvement as a spy. She's charged with getting closer to Eva Braun and find information useful to the British government. 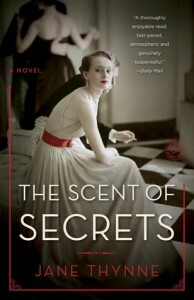 A subplot involving a secretary for a high-ranking female minister in the Nazi party ties into an early mystery. I enjoyed the story. I haven't read much WWII fiction set in Germany, so I found this a nice change of pace from what I usually read. Now that I know this is the third book in a trilogy, though, I would like to know if Clara's story will continue. As the book nears its conclusion it really gets interesting, and it seems to be left open for another installment.